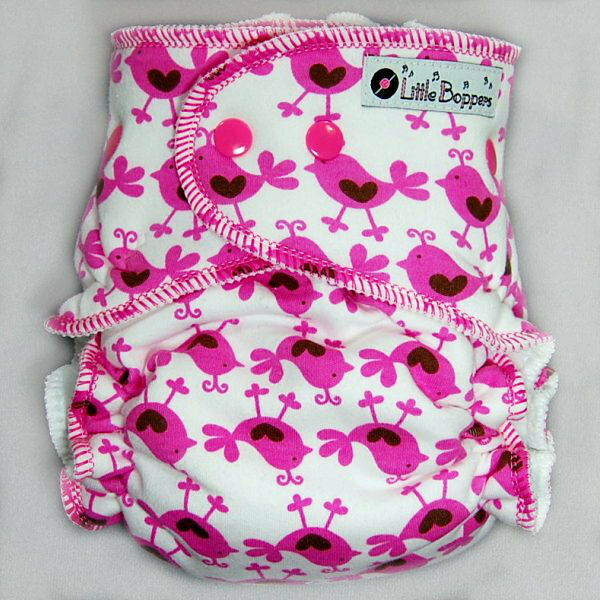 This listing is for a Made-to-Order (You Pick Size and Style) All-in-Two Cloth Diaper in the "Pink Chickadees" print. The pictures are representative of the print (made into a One Size Hidden-PUL AI2), but your specific diaper may look slightly different. 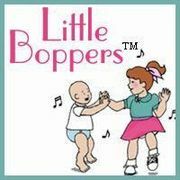 Little Boppersâ¢ handmade All-in-Two cloth diapers are plush, stylish and stashworthy. Super easy...just put it on your baby and go! No separate cover needed. 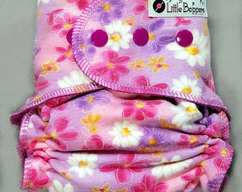 Add one to your baby's cloth diaper stash today! - Two parts that snap together: water-resistant shell and snap-in absorbent soaker pad. - Belly snaps are hidden so baby feels nothing but soft fabric (on the One Size option, belly snaps are hidden under a snap-in belly buffer). 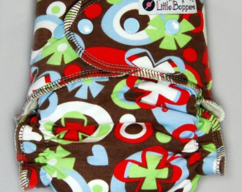 - The snap-in three petal soaker pad provides great absorbency. - Soft hidden elastic at the legs and back waist contain messes. - Professional polyresin snaps provide a range of comfortable size adjustments. - Trimmed with soft woolly nylon thread. - No separate cover needed! - Choice of Size (Newborn 6-15 lbs, Big Nb 8-18 lbs, Small/Medium 10-25 lbs, Medium/Long 15-30 lbs, Large 20-40+ lbs, or One Size 10-40 lbs). - Choice of Style (Hidden-PUL, or Wind Pro fleece). "PUL" is polyurethane laminated polyester knit fabric commonly used in diapering products. Wind Pro fleece is an exceptional high-quality polyester polar fleece produced by Polartec brand, that is both breathable and water resistant. Both options are popular choices. Hidden-PUL is a little trimmer. Wind Pro fleece is a little more breathable for baby's skin. OUTER LAYER: Cotton interlock knit "Pink Chickadees" print. INNER LAYER: Your choice: either Wind Pro fleece by Polartec, or choose a layer of PUL hidden between the outer print and an inner layer of Microfleece. SNAP-IN SOAKER PAD: Three-petals made of multiple cotton sherpa and bamboo fleece layers, topped with coordinating cotton velour (the One Size option also includes a snap-in booster). Note: This diaper does not require a cover for regular daytime use. If you want to use it during sleeptime, I would recommend using a cover over it just to be safe. 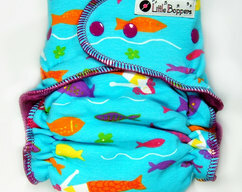 Little Boppers diapers and covers are all made by me, in my smoke-free, pet-friendly home in Central Texas, USA. This Made-To-Order item may take up to 1-2 weeks to ship. Please also check out my many instock diapers that are ready for immediate shipment!